50 sq ft studios: Hey Little Miss Muffet, I made my own tuffet! 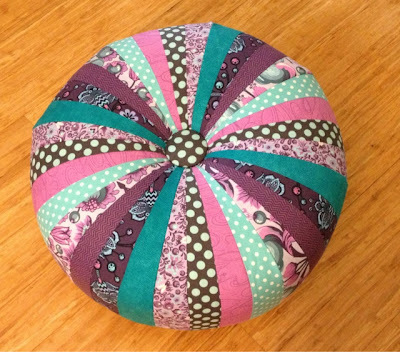 Hey Little Miss Muffet, I made my own tuffet! I thought I'd share some information and pictures from a project that I completed this week in a class. The Pattern is The Tuffet by Myra Mitchell. I think my tuffet turned out well. The colors/fabrics that I selected are very me. Creating the top wasn't very difficult or time consuming, but it would have been easier if I had previously done foundation piecing (you sew the visible fabric on to muslin). No fancy sewing machine needed. You just need a straight stitch. I was fortunate to take the class from the pattern's creator, Myra Mitchell, along with Linda French at Quiltworks NW in Bellevue, WA. The pattern isn't sold online, but you can contact Myra via email or call her at (425) 392-5798 to purchase (or you can contact QuiltWorks NW if you prefer). If you are in the area, I'd keep my eyes peeled for their next scheduled class session. The ladies explained that you can scale the pattern up or down, and Myra even has a version of the pattern if you want to make a square tuffet (also 18" x 18"). I purchased all of the fabrics except the Dumb Dot at Pacific Fabrics. Now I just need to plan out my fabric for my 2nd one! LOVE, LOVE, LOVE!!!! I think I may have tuffet envy!?! This is adorable....is there a pattern available? Hi Melanie! Sorry for the delay in responding. Yes, there sure is. You can purchase it directly from the pattern designer, Myra Mitchell, by emailing her or calling (mmitchell@w-link.net or (425) 392-5798). You could also purchase it from QuiltWorks NW at (877) 295-7222. As I was scrolling through your blog here, I saw the picture and knew where I'd seen tuffets like that and it was at the fabric shop today. They have a display near the front of the store. I did get the fabric I sought and was mightily tempted by lots others, but restrained... for today anyway. I love the display with all the polka dot fabrics and the children's flannels were amazing. Someday I'll go back and test out Berninas. I've never sewn on one and would love to see what it is like to "drive a Rolls Royce", LOL. 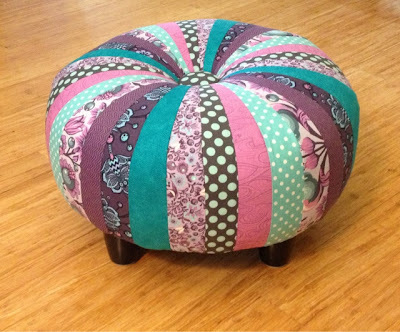 Thanks for sharing your beautiful tuffet with us, and for information about how/where to get the pattern. Being in Florida, I'm way too far away to visit the shop or take Myra's class, but I contacted her and will be getting the pattern. I really appreciate the blogosphere for the immediacy of sharing like this. Thank you!